His living Presence freely transmitted the non-separate, Love-Bliss of Divine Reality. From July 2015 through May 2016 I traveled to ten countries telling stories about Avatar Adi Da Samraj. These stories are a direct account of what occurred in His Life and Work that I was fortunate enough to witness. At the end of the tour in New Zealand with fifty people attending, a live recording was done. From that recording, sixteen stories were chosen to demonstrate the development of understanding and heart attraction that occurred for myself and all those who come into contact with Avatar Adi Da Samraj. Avatar Adi Da Samraj's Wisdom first changed me from actively being a spiritual seeker to understanding the error of seeking. His Presence of uncaused Happiness drew me into deeper feelings of acceptance and trust, opening my heart in love and devotion. The stories continue with the process of how He more fully Revealed His Enlightened State and how in-depth recognition drew me into His Perfect Freedom. The last stories describe His Transcendental Spiritual Transmission revealing the Prior Unity of egoless Love-Bliss, the one and only true Reality, prior to the separating act of ego-I. Avatar Adi Da's Play with devotees is always sparkling with His light and love. Gerald was granted the incomprehensible gift of witnessing countless leelas of Adi Da's liberating, profound, brilliant, and humorous revelation-play. He speaks Adi Da's leela with transparent love and devotion. Avatar Adi Da is invoked and dances before our mind's eyes with delightful detail and recognition. Listen, feel, and let yourself be transformed by these enchanting and essential sacred histories. I listened with rapt attention as Gerald related his stories of four decades spent in the company of Avatar Adi Da. Gerald's enthusiasm, humor, and sincere devotion were infectious. I felt myself drawn-in to the happenings he described. At the same time, I felt a sense of spaciousness and heart-opening as Gerald described the effect of Adi Da upon his life. My breathing became slow and deep. A quiet sense of joy suffused me. I felt Adi Da's influence coming through Gerald's communication. What an amazing event!" The storied Leelas that Gerald Sheinfeld has compiled are very unique and intimate with Avatar Adi Da. 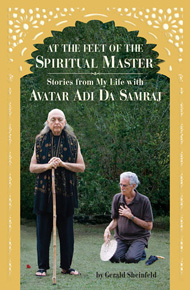 Gerald was uniquely intimate with Avatar Adi Da's life story, and his detailed accounting, in love of Adi Da, with at times great humour, and beautiful storytelling, are a real treat. The Leelas that Gerald has shared with us have been a true gift. Heart-food. As Gerald told Adi Da’s leelas, he clarified what Adi Da was teaching in his interactions with devotees. This was helpful because one might wonder why Avatar Adi Da did and said what He did. Hearing about how Adi Da talked and laughed and cried with devotees brought to me a sense of how intimate and compassionate he was with devotees. As Gerald recounted Adi Da’s leelas, I could practically see Adi Da sitting with devotees. I could hear His voice and laughter! All in all, it was a profound reminder of Adi Da’s appearance in the world. My background as a seeker and more. His Divine state of love-bliss was directly transmitted. He answered my heart’s prayers about true happiness. The essence of the teaching was given without a word spoken. His enlightened human qualities awakened my trust. His Divine freedom was all consuming. He showed He offers a direct feeling relationship, not a technique. He is the non-separate love-bliss of conscious reality. He awakened my heart to feel and “know” He is the true condition of all. His enlightened state of “Brightness” was obvious. History of the Divine Avatar Adi Da Samraj. Adi Da speaking about His teaching of truth. His Divine state awakened our hearts. He revealed the prior unity that is our very truth. He directly blessed my parents. He drew my father to come to me, one day after my father died. He expressed unlimited feeling in His Divine image art. He transmitted His Divine presence through His art. He freely gave the full awakening of the witness consciousness. His summary instructions that directly serve the awakening of Divine consciousness are given here.